2#1 – You may experience physical symptoms, like unexplained aches and pains. 3#2 – An increase in anxiety leads to the experience of mild panic attacks. 4#3 – Difficulty facing any challenges or struggles that come your way. 5#4 – You struggle to get a good night sleep. 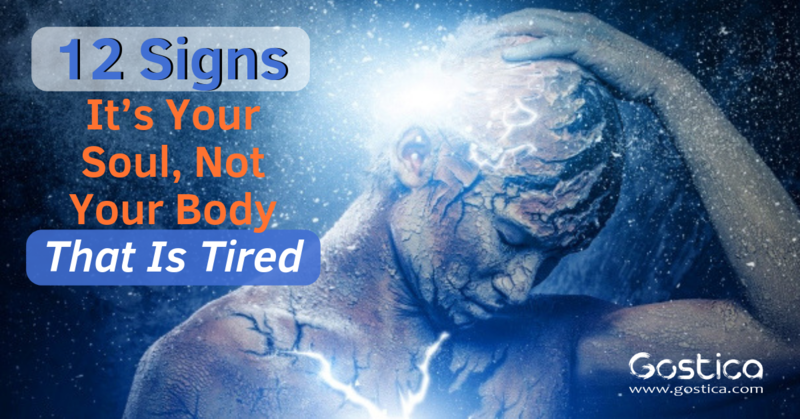 6#5 – Regardless of how much sleep you get, you’re still feeling exhausted. 7#6 – Negative feelings of bitterness, anger, resentment or jealousy control your mind. 8#7 – An unrelenting feeling of loneliness may set in. 9#8 – You find yourself feeling disoriented or out of sync. 10#9 – Physical exhaustion will set in, leaving you feeling weak and unmotivated. 11#10 – Confusion and difficulty make it hard to make sense of how you’re feeling. 12#11 – Thoughts of your future leave you feeling scared and unsure. 13#12 – Your emotions and feelings are more intense than ever before. Soul exhaustion or ‘soul sickness’ as it is sometimes called occurs when we fail to properly take care of ourselves on a spiritual level. Much like a bank account, we need to pay attention to both the withdrawals AND deposits that we are putting into our spiritual well-being. If we are constantly taking from this reserve, relying on our soul to care for us and provide, without putting the time and effort into making deposits by prioritizing our spiritual health, we can leave ourselves spiritually bankrupt. Often when we think of matters of the soul, we forget that every aspect of our being is connected. Therefore, struggles of the heart and soul may actually manifest in a physical way. This includes feelings of pain and tension, dizziness, nausea, blurred vision, headaches and migraines, unexplained aches and pains. When the soul is exhausted we struggle to find peace in this dark, confusing and challenging world. This can lead to an increased feeling of anxiety, one that is unrelenting. This sudden onset of chronic anxiety can lead to mild panic attacks, often with no warning or clear explanation. Life is going to throw challenges and difficulties our way, and generally, we find the strength and courage to face these challenges directly. However, when the soul is weary we find ourselves feeling ‘weak’ and burdened. Even the idea of facing the smallest of challenges can feel overwhelming and impossible, unable to handle whatever it may be. At night you find yourself feeling extremely restless and on edge, unable to calm your mind long enough to fall asleep. If you can refocus your mind long enough to drift off, you’re met with intensely realistic dreams, even nightmares at times, disturbing your attempt to find any rest. While getting a good night’s sleep, or even grabbing a quick nap can help to remedy physical exhaustion, sleep does nothing for tiredness of the soul. You can get all the sleep in the world, but if your soul is tired you’re still going to struggle. Even if you can quiet your mind and drift off for a night, you will wake up feeling just as exhausted as you were when you originally crawled into bed. Everything around us is created from and controlled by the energy that we are feeling, both positive and negative. When the soul is tired, it is no longer working to manage this energy in our lives. As a result, it’s incredibly common for the negative energy we experience to increase. This triggers toxic feelings including anger, frustration, bitterness, resentment, envy, and jealousy. Try not to allow these feelings to consume you. Many who are experiencing exhaustion of the soul will find themselves distanced from friends and family members, not necessarily in physical distance, but mentally, emotionally and spiritually distanced. You may find yourself questioning your ability to trust or rely upon others, instead, feeling lonely and alone in the world. As you go through life, you will find that various aspects of the world around you all seem to work together somehow, part of a bigger picture. Also known as coincidences, these moments often reassure us that the world is greater than ourselves. However, if your soul is tired you may suddenly find yourself feeling a disconnect, as though you are out of sync with the world, and even that your mind, body, and soul are out of sync with one another. This feeling, best described as disorientation, can make it difficult to continue moving forward. This is where it becomes confusing for those that are trying to decipher between physical and spiritual exhaustion. Often spiritual exhaustion actually causes physical exhaustion, leaving the body feeling drained of all energy and motivation. Even the idea of having to find the energy to be physically active is completely overwhelming, leaving you feeling eager to crawl into bed and go nowhere. Some people struggle to understand their emotions and feelings on an ongoing basis, however, when the soul is tired this confusion becomes even more challenging. If someone were to ask you how you’re feeling, you fail to put it into words because you can’t describe it. In fact, you’re not even sure what you’re feeling yourself. You know something is off, but you can’t quite put your finger on what it is. When the soul is exhausted, it fails to provide you with a clear image of the future, your direction for the future. Without an idea of where you are going and what you are working to attain, you are left wandering aimlessly. This can create great unease. Thoughts of the future and what is to come are often overwhelming and frightening when you are left with no plan. There are those who are highly sensitive and emotional, feeling every experience deeply and without restraint, while others are better adept at managing their emotions. However, if the soul is exhausted, even those with the greatest restraint will find them to be overwhelming. These intense emotions may leave you crying at the drop of a hat or lashing out in uncontrolled anger. While there is no guarantee that you can avoid exhaustion of the soul, as it is a condition that plagues us all from time to time, there are steps that you can take to practice self-care. This will help you to rest, recuperate and recharge, reenergizing the soul. Meditation will allow you to quiet the mind, reducing stress and negative influences on your life. This can be practiced either by finding a quiet place to sit or walking outdoors in a form of walking meditation.